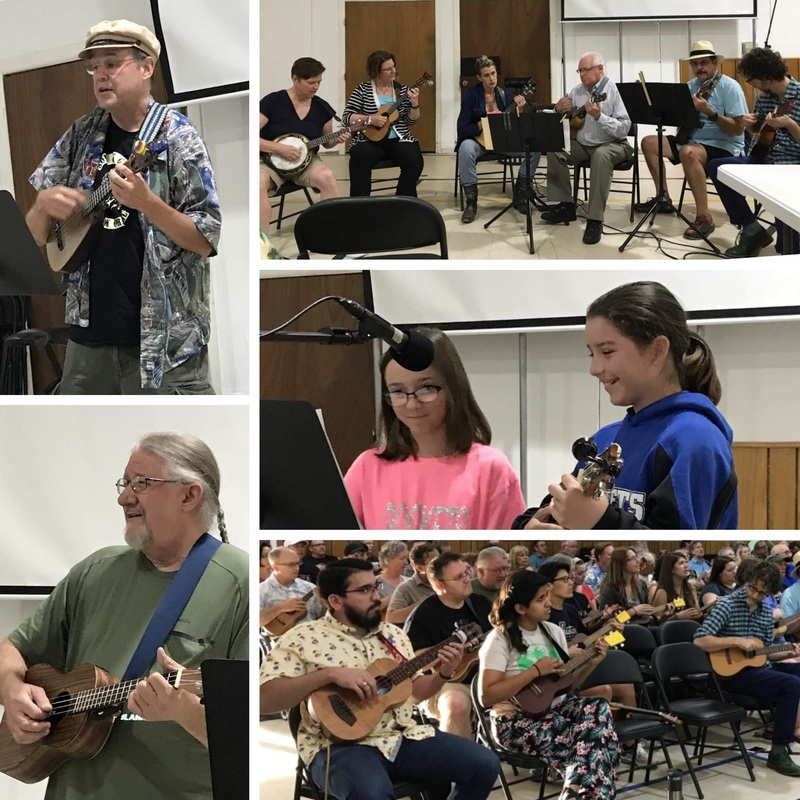 We got started with introductions and ukulele news, including reminders for our upcoming Ukulele Open Mic Happy Hour on September 1st and Uketania 9 (Ukulele Willie) on September 19. We then warmed up our fingers, ukuleles and voices with Bob Marley’s “Three Little Birds.” Next, Bob told us a little about his arrangement of “Chandelier” and performed it for us, to give us an example of what we’d be singing and playing. Bob then guided the group through practicing the strum patterns, chord progressions and picking options for this song. We played it through a several times, getting more confident and sounding better and better with each run through. We hope you enjoy our performance on YouTube! To play along with us, you can download the lyrics and chords for our arrangement of “Chandelier” or download a copy of the presentation and instruction guide (what we project on the screen for all to follow along, including exercises and drills). If you don’t already follow this website, why not take a moment to click on the “Follow Austin Ukulele Society” button? We’d really appreciate it! It’s in the right margin, just under the “Like us on Facebook” button and looks just like this: . 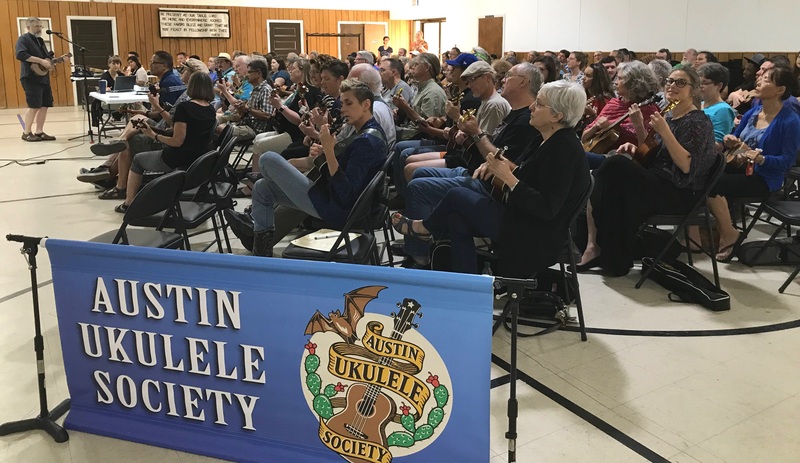 By following our website, you’ll always be kept up-to-date with the latest meeting announcements and other Austin Ukulele Society news. Thank you so much! We enjoyed our open mic participants’ performances. Thanks to the Kevin Carroll’s Celtic music group, Vince, Tate and Mason, and The John Davenport for sharing their talent with a great variety of tunes. For more downloadable music, visit our Ukulele Music Library. For more Austin Ukulele Society videos, check out our YouTube Channel. Contact Us if you have any questions or would like to be added to our mailing list! This entry was posted in AUS activities on August 13, 2018 by Austin Ukulele Society.